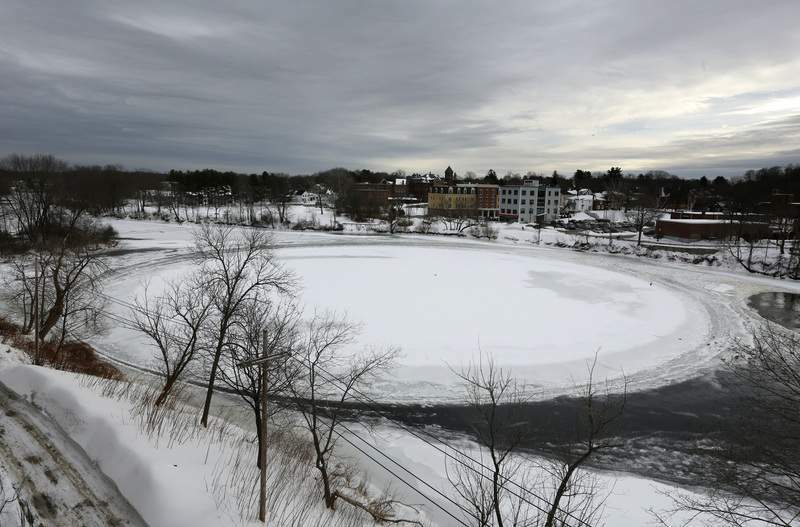 WESTBROOK, Maine – Maine's giant spinning ice disk may soon meet its end because of unseasonably warm weather. The Portland Press Herald reports the disk in the Presumpscot River has lost most of the shape and appearance that made it look like a blue moon. Westbrook spokeswoman Tina Radel says that the disk was on the move Wednesday and that its "time may be limited." The ice disk formed in early January, drawing crowds to the river's edge and attracting attention online. It formed naturally where there is a circular current that creates a whirlpool effect. Radel says a webcam set up by scientists from Brown University that provides time-lapse photography of the disk will remain in operation through the spring.